Leonid MAC - Teacher's Corner. Educational tools, lectures and briefings. Amateur astronomers interested in helping to monitor the Leonid shower could make an effort to collect counts of Leonid meteors in 1-minute intervals. It takes the shower about 2 minutes to cross the United States from the East Coast to the West Coast. With precise enough data, we can see the shower sweep accross the country and recognize filamentary structure, if there is any. Here is an electronic form to report such flux measurements (on-line and off-line), designed by Glenn Deardorf. Kitchen Comets - Make a comet with this simple recipe. "Plotting meteors from video" class. Figure shows plots of meteors on star charts by kids age 5-18. Listen to Leonid MAC PI and SETI Institute astronomer Dr. Peter Jenniskens give a public seminar webcast on expected meteor activity and the various Leonid MAC experiments for NASA's Astrobiology Institute. Jane Houston Jones, Mike Koop, and Morris Jones have provided talks to many Bay Area California Astronomy clubs during 2000. Some other participants are available too for talks and presentations. Jane first offered to speak to clubs through the Astronomical Asociation of Northern California (AANC) club membership. 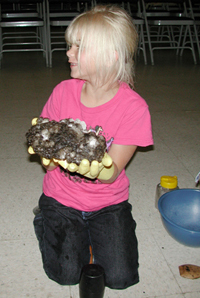 Jane is President of this group and Morris is on the board of directors. Here's a list of the talks given since the beginning of the year 2000. 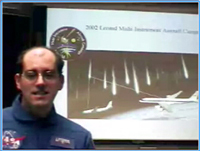 Peter Jenniskens provided a lecture on the Leonid meteor shower for school children at Mildenhall AFB and Lakenheat AFB in U.K. on Nov. 15, 1999. Thursday's Classroom - NASA Space Science News for October 28, 1999. This week's episode of Thursday's Classroom is the first of a three part series about the upcoming Leonid meteor shower. In this first installment, lesson plans include "Star War" (a fun game of cards to teach kids about visual magnitudes), "Meteor Math", a classroom meteor shower simulation and more!